Prvi Partizan is here to save the day with another ammo load in an unusual cartridge, the 7.62x25 Tokarev. 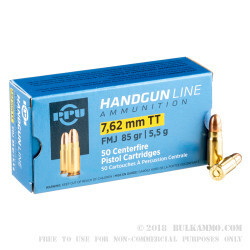 This cartridge will perform well in the TT-33 pistol, propelling a light 85 grain bullet at an impressive muzzle velocity of 1,722 feet per second for a flat-shooting ballistic profile. 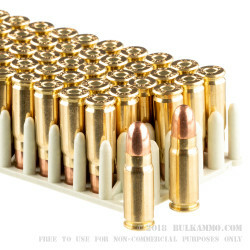 This ammunition is new production using non-corrosive Boxer primers and brass cases. Each box contains 50 cartridges. 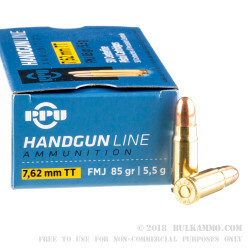 A Serbian ammunition manufacturer founded in 1927, Prvi Partizan has emerged from the Cold War as a thriving private company with a unique market niche: producing new, brass-cased ammo with non-corrosive primers for old cartridges such as .303 British, 7.5x54mm French, and 7.92x33mm Kurz that other manufacturers have left behind. With over 400 different cartridges in production, the company has helped many an old gun stay in the field or at the range. 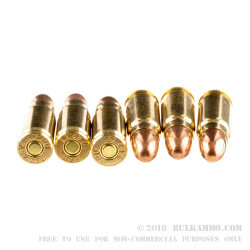 Prvi Partizan also produces well-regarded and affordable ammunition for guns with popular Western and former Warsaw Pact chamberings such as .223 Remington and 7.62x39mm.